Sonic & Tails Spinner is a 2002 redemption machine. It is no longer manufactured, but can still be found in various arcades in the United States. Players spin the wheel and gain points which can then be redeemed for tickets. In turn these tickets can be cashed in for prizes. The sound effects and cabinet art are from Sonic Adventure. After a coin is inserted, the Sonic and Tails wheels start spinning, in opposite directions. The player presses the flashing "Sonic" button first to stop the Sonic wheel, and the number on the outside ring that Sonic's finger is pointing to is the first multiplier. After stopping the Sonic wheel, the "Tails" button activates, and stops the Tails wheel when pressed. Tails points to the numbers on the inside ring. The amount of tickets dispensed is Sonic's number multiplied by Tails' number. If nobody is playing, part of the Twinkle Park level music plays. When a coin is inserted, it plays the "checkpoint" sound from Sonic Adventure. While the wheels are spinning, it loops part of the Twinkle Circuit music. If more than 10 tickets are won, a character voice clip congratulates the player. Tails- "Yeah!" or "You did it!" Sonic- "Cool!" or "You got it!" If less than 10 tickets are won, there is no voice clip, and a "gloomy" music clip, probably from Sonic Adventure, plays. 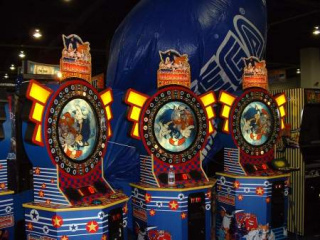 If more than 100 tickets are won,the machine plays Sonic Adventure "Level complete" music and a character voice clip. As tickets are dispensed, the ring sound effect plays for every 2 tickets won.